Crossing the Lachine Canal in down town Montreal. This is a favourate spot for train watching because Place Bonaventure and the VIA/CN Central Station are just around the bend and only 2 KM up the track. But I like this photo because my favourate locomotives are working away moving people in and out of the city. 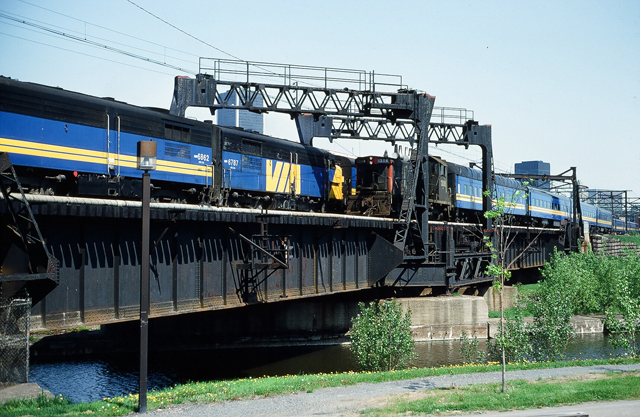 The FPA4 and FPB4 were my selected favourites in Kapuskasing years before when the were dressed in red, white and black as God intended and that SW1200rs was up there as well shunting freight between the Algoma Central at Hearst and Ontario Northland in Cochran. Good to see they have still found honest work even late into the 80’s. The real reason for this photo, or at least the reason I was on hand, is because there was a football game in Montreal. The family always managed to have the time off to see games in Montreal and Ottawa when the Roughriders were in town. We would drive to Ottawa but took the train out of Belleville when traveling farther east. That became a fan trip extraordinaire. I transferred the overhead electrical structure and the rusting deck girder bridge idea to the ‘down town’ district on my N scale layout in Winnipeg a few years later. The tracks didn’t go anywhere but up against an outside wall but it sure added a lot of character to the scene.